Brea, CA (September 10, 2018) - Suzuki Motor of America (SMAI) is proud to release technical details for the all-new 2019 RM-Z250 motocrosser. 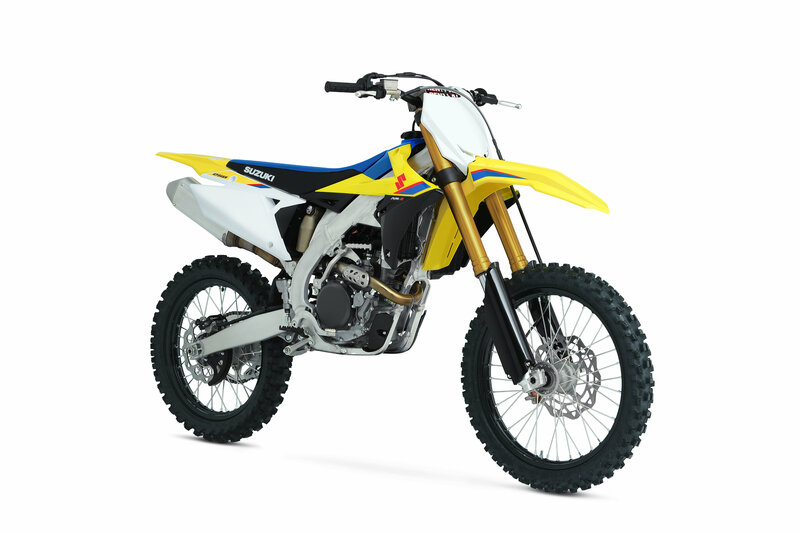 The RM-Z250’s features and preliminary specifications are available on the SuzukiCycles.com website. Redesigned for 2019, the updated RM-Z250 now mirrors the cutting-edge styling of the championship-caliber RM-Z450. An upgraded engine and list of chassis changes that achieve superior performance, were developed so the RM-Z250 remains the best handling 250 on the track. The 2019 RM-Z250 features a new cylinder head that contributes to better throttle response and power, and a new dual injector EFI system that increases performance through the entire rev-range. Exceptional handling from a new, lighter aluminum frame and swingarm contribute to the RM-Z250's advancement as well as a new KYB-supplied suspension that includes a new coil-spring fork. Race-ready Dunlop MX33 tires and improved braking performance increases stopping power and feel with a larger front brake rotor to help keep the rider in control. Back in the pits, tuning the new EFI system for maximum performance is easy thanks to Suzuki’s proven fuel-coupler system. Evolving the fundamental performance elements of ‘RUN’, ‘TURN’ and ‘STOP’ to a new level, Suzuki has infused the Winning Balance into the 2019 RM-Z250. With particular attention focused on advancing its ‘TURN’ capabilities, Suzuki engineers have achieved an even greater level of balance between the race-proven engine and the slim, nimble chassis to again raise the standard for cornering performance. Suzuki’s renowned RM Army and Amateur Racing Support continues, offering over $6.2 million in contingency, trackside support, and the opportunity to train with Ricky Carmichael at Suzuki’s exclusive Camp Carmichael. Want to see why champions choose Suzuki? Visit www.racesuzuki.com for more information on Suzuki’s Amateur Support Program and enlist in the RM ARMY!